Sometimes you get the essay you need. 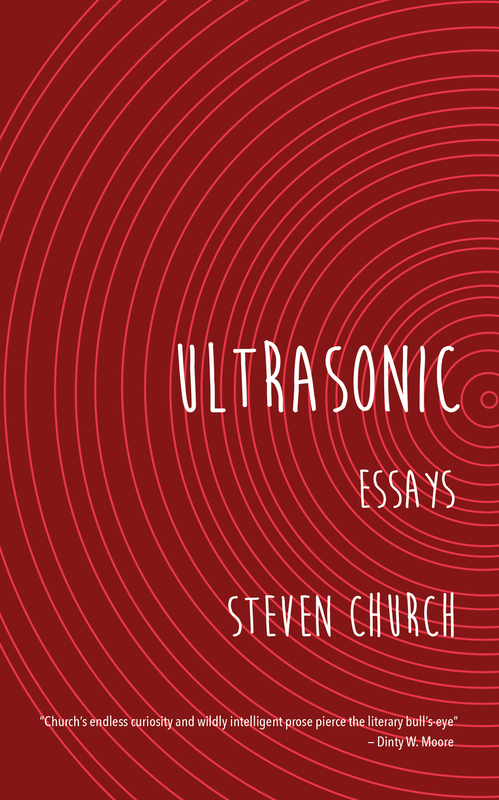 Many people have written about Ultrasonic, Steven Church’s most recent essay collection—about the elegant soundscapes, the deep empathy, the alternating mischievousness and profundity. All sentiments with which I heartily concur—but all of which have previously been said. What I will say is simply that this book spoke to me, that these essays, these ideas, often these individual sentences, popped off the page like firecrackers. I readily acknowledge that part of that crackling connectivity could be sparked simply by a shared frame of reference—that Steven Church and I are of the same generation, from the Midwest, came of age during the last decade of Nuclear Fear, possess similar tastes in sports and rock music. But a few common cultural denominators are not enough to explain the powerful effect of this book. So many of the soundings in Ultrasonic pinged back ideas from the recesses of my cranium that they became a continuous echo. I could not finish a single essay without stopping to scrawl some note spawned by one of these ripples. Perhaps this inability to stay locked in these essays is just some inherent narcissism on my part, a mind’s need to inject the self into the story to stay interested. But I think the experience of Ultrasonic is so much more than that, because I have read many great books during which I engulfed chapters and stories and twenty-page chunks of text without once ricocheting out into my own sphere of thought. What makes Church’s Ultrasonic so invigorating is the incendiary alchemy at work on these pages, a churning, visceral process that demands attention and response. This is what the best writing accomplishes. Beyond just making the personal relatable, or universal—noble achievements in themselves—the best writing sparks a conflagration of memories, welds itself to our psyche and becomes a part of our emotional-intellectual-creative forge. And this in turn is the amalgamation of culture itself, how we ingest, interpret, appropriate and re-mix the art of others into our own offering, our own limb of the cultural sculpture. “Art, while perhaps created in one, doesn’t exist in a vacuum once it is given to an audience. Once you turn art loose in the world, there’s no controlling how people interact with it, appropriate it, or abuse it.” Church wrote these words in response to his discovery that some of his favorite theme songs for writing, editing, (and strutting), were the same tracks popular with our post-9/11 torturers. But I will reclaim his sentiment for something positive, as a sounding-line for my own remixes of his inciting sentences—and as an excuse to offer up the backstory of my first encounter with Church’s essays. In the spring of 2009 I started a yearlong stint as Nonfiction Editor at the Sonora Review. One of the first things I did after taking the reigns was to query Steven Church, this pleasant, burly fellow I’d met after an AWP panel in Chicago where he had used the most brilliantly disgusting writing metaphor I’d ever heard. I was only a few months into my MFA, after a decade away from school, still uncertain of my place as a writer in academia. I was also wrestling seriously for the first time with the ethics of writing Nonfiction, struggling to forge and weld my first literary limb. “Writing isn’t really a job so much as it is a pathology,” Church’s words sparked up off the page, “a life of the mind that—if you are extremely lucky—someone pays you to indulge. It is an identity, a uniform you put on and never take off…It is a way of seeing the world.” My blind faith when I declined that original offering was apparently guided by a subconscious intuition that there was a forthcoming Church essay that would speak to me so directly. I got the essay I needed. Ultrasonic ends up being a difficult book to read cover-to-cover, a victim of its brilliance—the continual dithering slaps Church offers up in his essays. I offer up no over-arching thematic interpretations, or summary of the whole book. I’ll just tell you that Ultrasonic is full of alchemic prose that made me pause and re-read, dog-ear pages, highlight and scrawl immediate notes in accompaniment—that my copy of this book is now a collage of beautiful graffiti. So I guess I am writing this for those who have not yet read Ultrasonic. Like the editor of a good movie trailer, I want to entice the reader to find a comfortable chair, grab some popcorn, and experience this book. These are the essays you’ve been looking for. Kirk Wisland’s work has appeared in The Normal School, Creative Nonfiction, The Diagram, Paper Darts, Electric Literature, Phoebe, Essay Daily, and in the memoir anthology Roll: A Collection of Personal Narratives, and the Milkweed Press Minnesota Fiction Anthology Fiction on a Stick. He is a doctoral student in Creative Writing at Ohio University. What fun to see the neighbor kid who grew up down the street develop from personal memoir (I’m a vague extra in one of the early books) to full-fledged intellectual. As long as Mr. Church never gives up March Madness, all is well with the universe. You are currently reading The Incendiary Alchemy of Steven Church’s Ultrasonic: A Book Review at BREVITY's Nonfiction Blog.